Noah had his first real fever this month. He's been sick in the past where he felt slightly warm but nothing serious. This month he woke up in the middle of the night burning up and he had a 102 fever. Over the next 3 days it rose to 106 at the highest so we kept giving him tylenol on a regular basis to keep it down. Thankfully after the three days it didn't turn into anything bad (like roseola or coxsackie). 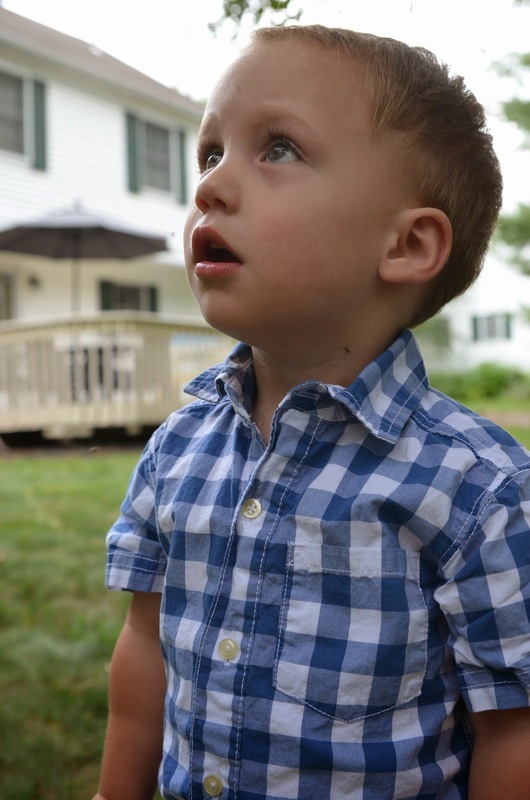 This month we took Noah to visit his cousins in Rhode Island. He had so much fun playing with them at the beach! He really loves watching older kids and really loved following Kaitlyn around. This is the second time he seemed to love playing with an older girl. I joke that instead of a little sibling can I just get a 6 year old sister for Noah instead? 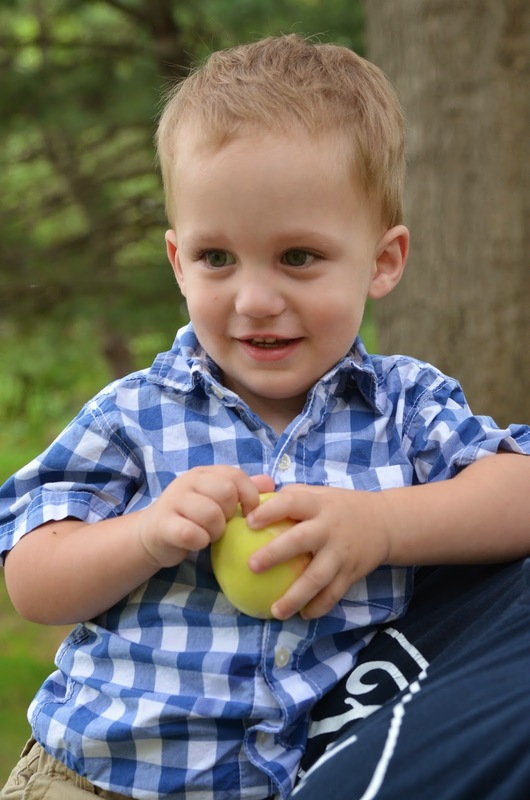 Noah went apple picking for the first time this month. While he preferred the strawberry picking I think he still had fun. Noah tried Gymboree and PEP Club for the first time this month. We signed up for both starting in September :) We've also had many play dates this month, with friends from our old and new towns. While we've wondered for a while, I think it's pretty safe to say that Noah is left handed. 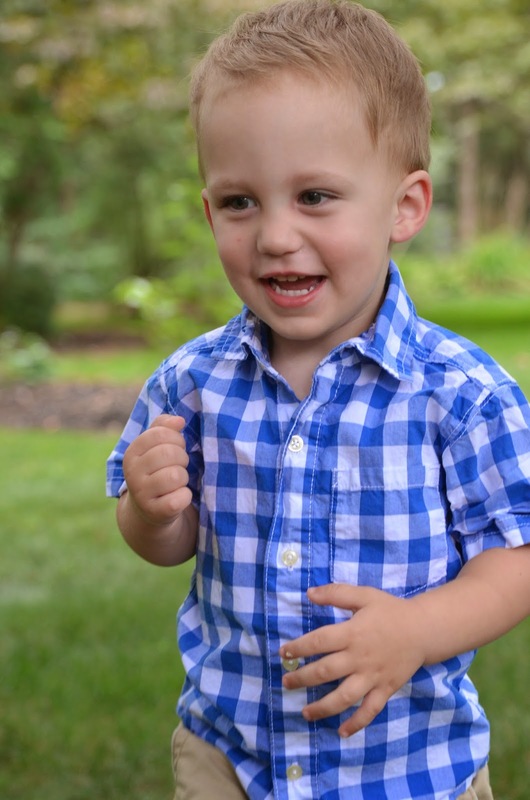 I know it's still early to know for sure, but he often eats, colors, and throws with his left hand. My uncle was a lefty and I've heard they tend to be creative... so cool! Once again these are unofficial since he hasn't been measured by the doctor since 18 months. 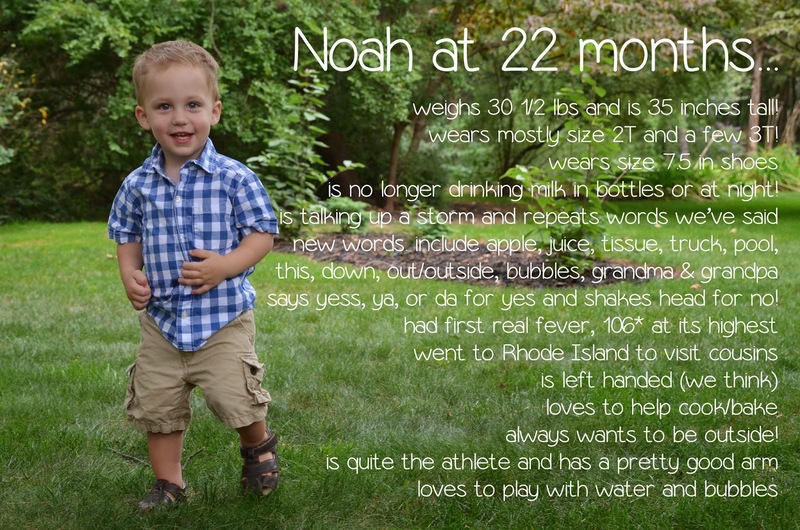 Per our scale and measuring tape, Noah weighs 30 1/2 lbs (lost half a pound) and is 35 inches tall. Oh boy, sizes are seriously confusing me right now! 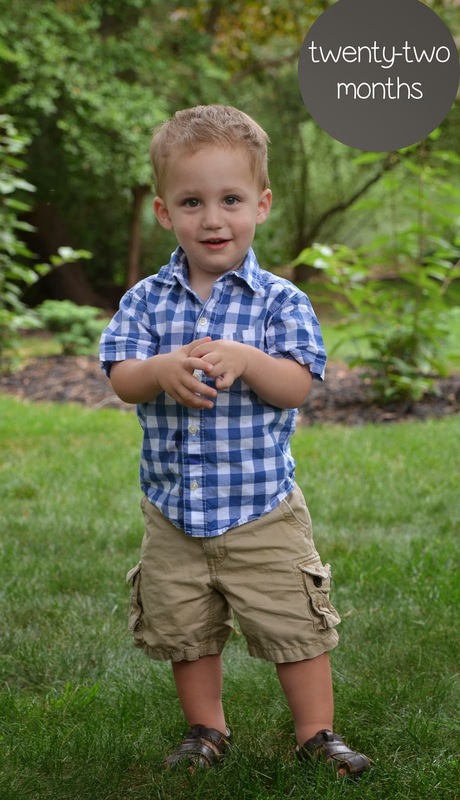 He can wear size 18-24M or 2T in shorts. He wears 2T in tops. I like PJs looser so he wears a 3T in those. We are still figuring out his sizing for fall clothes. He wears a size 7.5 in shoes. I am a believer that kids do things when they are ready to do them. I am totally happy (yet sleep deprived) waiting for Noah to start sleeping better on his own. However, Noah had been waking a lot wanting a milk bottle during the night. While we diluted the milk a lot (3 oz milk, 6 oz water), he was drinking A LOT (6 bottles throughout the night). While I haven't figured out a way to make him sleep longer stretches (since I won't let him cry it out) I instead decided to focus on something I could control. It only took a few nights, but Noah is no longer drinking milk from a bottle. At bedtime, he gets a cup of milk and a bottle of water. He usually only drinks a little of the milk and drains the water. I rock him to sleep and then put him in his crib. Recently he's been lasting in there until 12:30. I then bring him into his big bed and we finish the night there. Noah is a smart kid, so when I'd have bottles of milk in the cooler, he knew if he cried enough he'd get one. So instead I brought up a sippy cup of milk and the rest were just bottles of water. The first two nights when I gave him the water he would point to his mouth meaning he wanted the milk. I told him there wasn't any and said if he wanted milk he had to drink it from the cup. Surprisingly enough this actually worked and he's happy with just the water. By just changing this, he now wakes up on average 2-3 times a night instead of 6 times... huge deal for us! He usually goes to bed around 8:30 and wakes up for good around 7:30 (though Chris jokes that it's always earlier on the weekends)! Breakfast is usually a greek yogurt. Though we have recently started eating mini bagels or waffles as well. For lunch, we do grilled cheese, mac & cheese, leftovers, or we eat out. Some days I feel like Noah isn't really interested in lunch. He really enjoys eating dinner either out on the deck or in his booster seat at the table instead of in his high chair. He seems to really like chinese food, pasta, and chicken. He also likes to eat corn on the cob now. Recently Noah has become such a snacker! We gave him lots of popsicles when he was sick and now he's obsessed! He goes into the freezer himself and brings them to me throughout the day... we just installed a lock on the freezer because of it! I usually make the smoothies now as an afternoon snack when he gets up from nap. I like this better than at breakfast because I find it helps keep him full until dinner. The talking has definitely improved lately! New words this month include tissue, apple, juice, truck, banana, down, outside/out, let's go, broom, pool, bubbles, this, boy, and girl. His favorite word by far though is apple. Ever since we went apple picking he says it NONSTOP! He says "pa" and "ma" for grandpa and grandma. For yes, he either says "yes", "ya", or my favorite "da". And he doesn't say no, but instead just shakes his head a lot ;) In general he's starting to repeat more of what we say. Noah is currently obsessed with cars and trucks and he's becoming more interested in trains too. In Rhode Island he loved playing with the dump truck in the sand. It was a joy to watch Noah play trucks with his cousin Matthew. Noah's love for water and being outside hasn't died either. When Chris gets home from work, Noah immediately wants to go outside with him. Noah is fascinated by things in our garage... like his pails, the dust buster, and the broom. I love this time of night because it gives me a few minutes alone and I know they are both having fun. 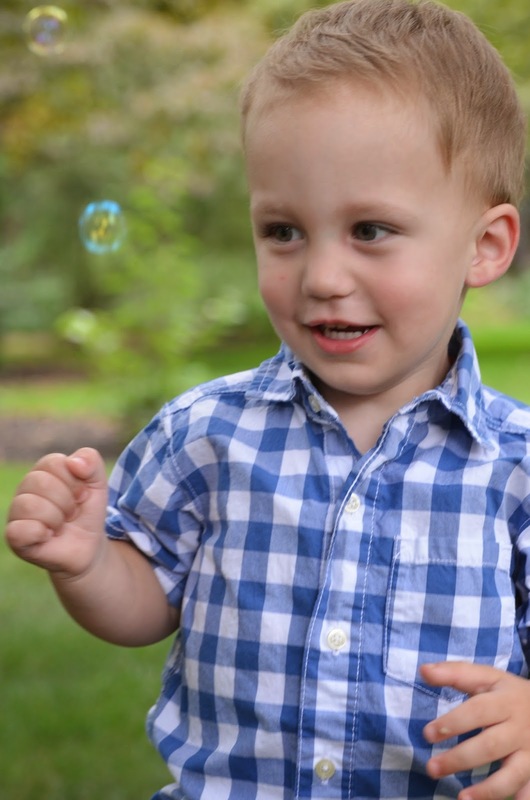 While outside he LOVES to play with bubbles. He's always loved them at Wompy's and other classes we take, but we just recently set up our own machine. He's hooked. Not only does Noah still like to watch me vacuum, but he now likes to play with my real vacuum on his own. He can play for literally half an hour just switching out the attachments! Make sure to stop by Jess and Ashley's blogs for the link up! such a big boy already! enjoy every minute! 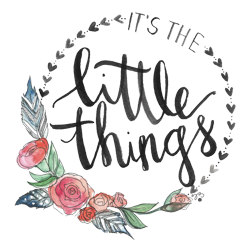 !Stopping by from the little things link up. Noah is so big already! I love that he is left handed! I am & it's definitely interesting! He'll love it when he gets older, it's a great trait to have! Oh that sleep schedule- of course better than it was before, but still- I wish a full nights sleep to you all! 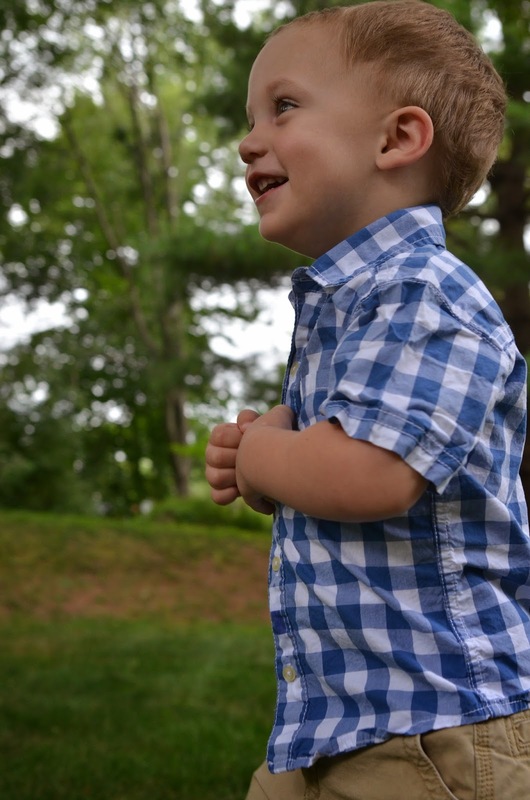 Otherwise, he is as cute and awesome as ever- toodlerhood has always been a favorite of mine.